**Traveling alone: add $855 for a private room (rates are based on double room occupancy: most rooms have one double bed). 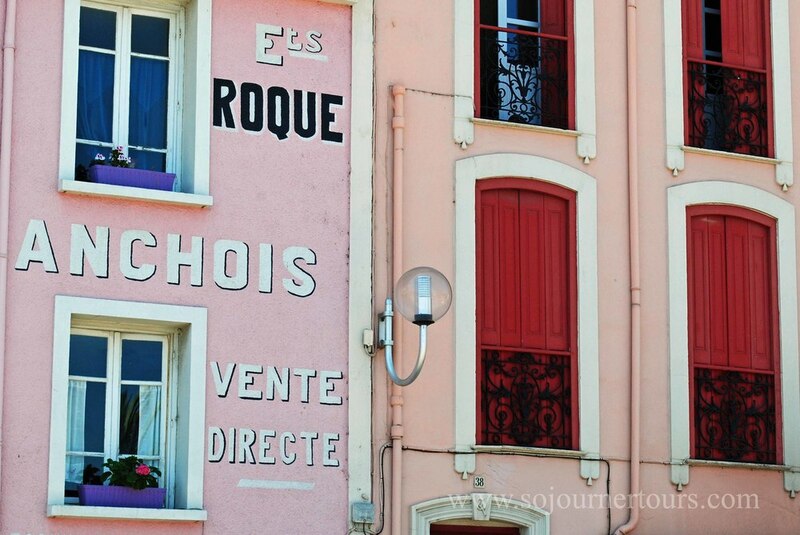 This is your sojourn if you want to perfect your French while experiencing the typical French lifestyle, learning the local culture and history and having time to explore at your own pace. Whether your French is at a low intermediate level or already advanced, you will have fun improving your language skills and cultural knowledge. Each day your language-study theme is centered around an excursion to a special local spot including a castle, vineyard and outdoor market. Morning language and culture classes cover vocabulary and grammar that you will use on the excursion. A beautiful Mediterranean fishing village at the foot of the Pyrenees, in a region rich in history and culture, Collioure is a fascinating and fun place to learn French. You'll stay in a cottage home like a local with your fellow sojourners and teaching guides so you can practice French while enjoying family-style meals and relaxing between activities. Your cottage is centrally located so you'll be able to easily explore the village on foot or stroll along the beach during your free time. 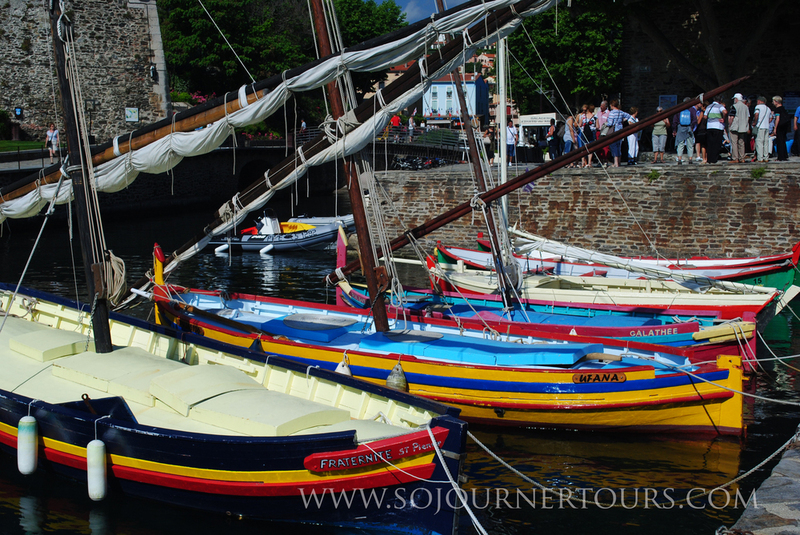 You'll arrange your own transportation to Collioure. If you are arriving by train, a Sojourner Tours representative will meet you at the station to help you transport your baggage to your temporary home. You'll have plenty of time to get into the local rhythm of life, strolling the cobble stoned streets, sitting at a cafe, shopping in boutiques, hiking, taking in a show or concert. Accommodation in a local cottage hosted by your guides. A tour of the city. Your guides will point out favorite cafes, bars & restaurants as well as the cinema, theater, art museum, popular parks, and more. Your base town will be Collioure (pop. <3,000), a quaint harbor-village nestled between the vineyard covered mountains and the sea on the craggy shores of the Vermillion coast --home to the renowned author of Master and Commander, Patrick O'Brian, for 50 years. The colors and charm of this area inspired some of the most famous European painters of the 1900s. Collioure's winding roads leading through pastel colored buildings, its red rooftops contrasting against the green mountains, and its stately church and castle juxtaposed against the blue sea inspired Matisse and Derain to found a new art movement that emphasized the use of strong colors: Fauvism. One of the two families that salt and pack anchovies traditionally. You may also want to discover the beautiful region surrounding the city by extending your stay to include the Best-Kept Secrets of the French-Spanish Borderland Sojourn at the beginning or end of your language immersion sojourn, which would enable you to daytrip around the area to enjoy the beautiful natural settings which inspired some of the greatest painters of the 20th century: Matisse, Dali, Picasso. You'd spend the week exploring the villages, wine tasting, dining in gastronomic restaurants and visiting exceptional historic sites. You will be staying with Lisa Gustavson (the owner, founder and CEO of Sojourner Tours who is also a part-time professor of French at Southwestern University). Lisa teaches Intermediate Grammar and Culture classes on art, food & wine in English. Francis Mathieu (co-owner of Sojourner Tours and tenured professor of French at Southwestern University). Francis teaches Advanced Grammar and discussion classes as well as Culture Classes on the History & Geography of the region in French. In the early 20th century, Matisse became the leading modern artist when he set about capturing the brightly colored fishermen's boats and houses in Collioure. AFTERNOON: Upon arrival, you can settle into your room in the centrally located cottage where you'll be staying with the other tour participants and hosted by Sojourner Tours owners Lisa & Francis. Your hosts will be there to help you settle in. While other guests are still arriving, you can start to explore the town on your own, relax at the cottage or perhaps get a drink at the tavern frequented by scores of famous writers and passing painters. RECEPTION & DINNER: You will meet the rest of the group to celebrate the beginning of your sojourn French-style with a typical apéritif at 6:00 pm and have a brief orientation. You will then enjoy a laid-back French dinner. View of a residential section of Collioure. A church steeple near the Dominican winetasting room and the museum of art. Strolling in downtown Collioure, view of the bay overlooking the castle and lighthouse-church. 3:00 EXCURSION Walking Tour of Collioure using today's grammar and vocabulary. 5:00 FREE TIME After your activity, you'll have enough free time to stroll around the charming historical city center, peek in some boutiques or have a drink at a café before meeting back up with the group. Wine maderising in the sun to become Banyuls. 2:00-5:00 FREE TIME You'll have enough free time to relax, study, stroll along the beach, shop, explore the village, pop in the art museum, do some wine tasting or have a drink at a café. 5:00 EXCURSION : Option of hiking along the coast or extending your free time in Collioure and joining the group at the vineyard by taxi at 6:30. 6:30 EXCURSION: Wine-Tasting at a fine coastal Vineyard Estate. Take time to wander amidst the vines, walk on the beach, see the dynamite factory. 10:00-12:00 EXCURSION: Shopping the weekly open-air market. You will start with a guided tour followed by shopping assignments so everyone procures an item for your picnic. 12:30 PICNIC LUNCH featuring fresh foods from the market. 2:30-5:30 FREE TIME You'll have enough free time to relax, study, stroll along the beach, shop, explore the village, pop in the art museum, do some wine tasting or have a drink at a café. 4:00 EXCURSION Tour of the local castle. 5:00 EXCURSION Hike or take the "petit train" up through the vineyards to Fort St. Elme for panoramic views of the city and a visit of the fort. 8:00 LUXURIOUS DINNER at a Michelin Star Restaurant. 8:00 FAREWELL DINNER at a local restaurant followed by champagne and dessert at the cottage. 11:30-12:00 Certificate Presentation & Reception.